Join Alhambra Preservation Group and Alhambra Historical Society at a co-sponsored event to explore the life and architectural designs of Reginald Davis Johnson, Alhambra’s link to this architectural visionary and learn more about other architects whose designs can be found in Alhambra’s neighborhoods at the Alhambra Historical Society meeting on Wednesday, November 15 at 7 p.m. in the Masonic Center, 9 West Woodward, corner of First Street, in Alhambra. We’ve all heard stories about the woman who finds a Picasso painting tucked away in a long-forgotten corner of her attic or the man who happens upon a letter penned by John F. Kennedy tucked between the pages of his grandmother’s diary. Alhambra has a recently discovered architectural gem of its own in the historic Chapel of St. Simon and Jude. 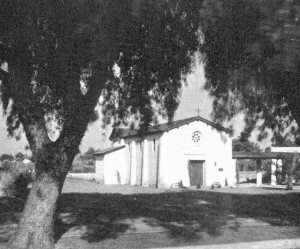 Alhambra’s quaint Chapel of St. Simon and Jude, which will be adapted and reused within the proposed Camellia Court development, was designed by Reginald Davis Johnson, a renowned architect, who shaped Santa Barbara’s visual identity and designed National Register of Historic Places-worthy homes, public buildings and churches. Reginald Davis Johnson’s designs range from the Biltmore hotel in Santa Barbara to All Saints Episcopal Church in Pasadena, from elegant mansions to nationally recognized public housing projects. Please join Alhambra’s Preservation Group and the Historical Society for this interesting talk, view items on display from Alhambra’s past; and enjoy refreshments during “Meet and Greet” beginning at 7 p.m. At 7:30 the meeting and program will begin. Admission is free. For further information about this meeting, or the Alhambra Historical Society, and the Museum, please call 626 300 8845.